Slug: BC-CNS-DACA in state tuition, 440 words. EDS: A previous version of this story misquoted Belen Sisa, in the fourth paragraph. She said the state has been attacking DACA recipients’ “right to an equitable education.” The story below has been corrected, but clients who used an earlier version are asked to run the correction that can be found here. PHOENIX – Dozens of student recipients and supporters of the Deferred Action for Childhood Arrivals program, known as DACA, rallied Monday outside the Arizona Supreme Court in support of in-state tuition rates for DREAMers. 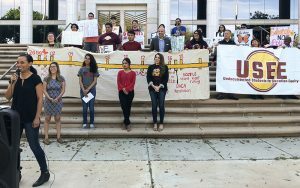 The demonstration was in response to the court’s hearing of oral arguments in the case of Attorney General Mark Brnovich suing the Arizona Board of Regents for offering in-state tuition rates to DACA recipients. The Undocumented Students for Educational Equity at Arizona State University, which is led by undocumented students, gathered on the front steps of the state’s highest court in the state two hours before oral arguments in the case. “The state of Arizona has been attacking not only community colleges, but also attacking our right to an equitable education in Arizona,” said Belen Sisa, the group’s advocacy director. DACA recipients, also known as DREAMers, are part of an Obama-era program that granted temporary protection from deportation for young people who were brought illegally into the United States as children; recipients also were given the chance to apply for permits to work. President Donald Trump gave an executive order to end DACA in September 2017, giving Congress until March 5 to find a permanent solution. That deadline came and went as the issue is being argued in federal courts. Arizona community colleges and universities have continued to offer in-state tuition to DACA students, despite a ruling in June 2017 by the Arizona Court of Appeals overturning a Maricopa County Court ruling from 2015 that granted the in-state tuition. According to the appeals court, Arizona law doesn’t specifically grant in-state tuition to DREAMers so community colleges were wrong when giving the group resident-tuition rates. The Maricopa County Community College District then appealed to the Arizona Supreme Court. Currently, in-state tuition at ASU for the 2017-18 school year is $10,792 compared with out-of-state tuition at $27,372. Tuition at ASU for dreamers would increase by $16,580 per semester. Outside the court room on Monday, Attorney General Mark Brnovich said it simply comes down to following the rule of law. Sisa, originally from Argentina, moved to Arizona when she was 6 and has attended Arizona public schools since. She is pursuing a degree in political science at ASU with plans to graduate in May. During Monday’s 40 minute hearing, the Supreme Court debated on how to define what “lawful presence” meant and whether DACA recipients have it. The court asked both sides to submit notices of what tuition will be for the next semester. No date was set for additional hearings.